Connect with other parents and children in our community! Play & Learn Groups are interactive programs for families in Falmouth, Woods Hole, and Mashpee. Play & Learn Specialists offer children a safe, literacy-rich environment to explore their world and develop new friendships. We've got something fun nearly everyday during our Spring Session! Click here to view our weekly schedule. Creative Movement Games, stories, music, and movement especially chosen to promote motor development and literacy. This weekly class is designed for children (ages 2 and up) and their caregivers @ Mashpee Public Library. Intergenerational Music & Movement Sing and dance with clients at JML Care Center in this rollicking group. 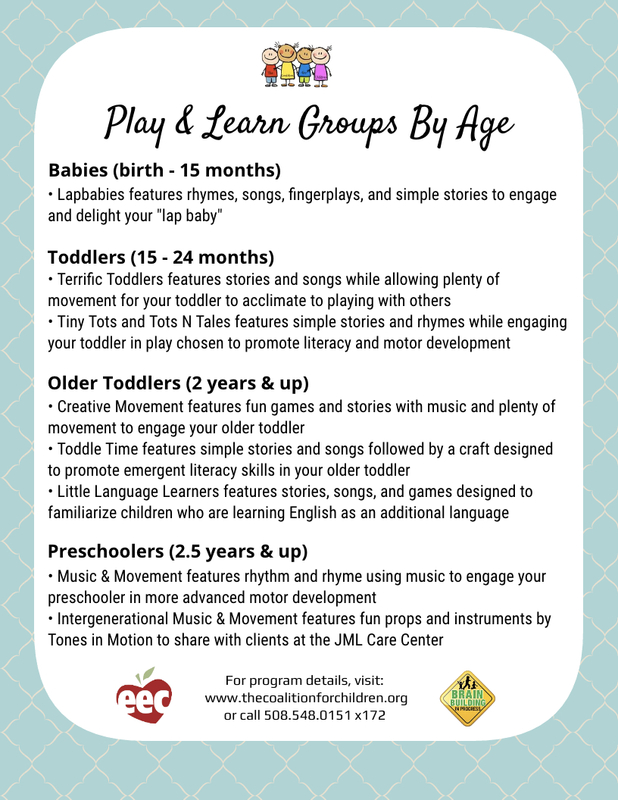 Enjoy lots of fun props and instruments from Tones in Motion with the clients as we explore rhythm and rhyme together, in this class for toddlers and children (ages 2.5 and up) and their caregivers @ The JML Care Center, located at 184 Ter Heun Drive, Falmouth. Little Language Learners Enjoy songs, stories, and games designed for 2 - 5 year olds who are learning English as an additional language @ Woods Hole Public Library. Need help with transportation? Email Tina. Lap Babies Enjoy songs, fingerplays, stories, and playtime in this class geared toward non-walkers (birth - 15 months) and their caregivers @ both the Falmouth and Mashpee Public Libraries. Mixed-Age Play Group Stories, games, songs, and play especially chosen to promote literacy and motor development. This is a closed group for children of all ages and their caregivers @ The Carriage House. Terrific Toddlers Enjoy movement, stories, and songs in this class for lapbabies graduates (ages 1 - 2.5 years) in our dedicated play space @ Falmouth Administration Building, lower level. *NEW* Families may enter through door nearest to the play space! This door has a ramp, instead of stairs, making it easier to bring your carriage/stroller, baby carrier, and your toddler into the building. Just knock and we'll greet you with a smile! Tiny Tots Stories, movement, songs, and play especially chosen to promote emergent literacy skills and motor development for toddlers (ages 15 - 24 months) with their caregivers @ Mashpee Public Library. Toddle Time Simple stories, songs and a craft designed for young children (up to age 4) and their caregivers @ Mashpee Public Library. Tots n Tales Stories, movement, songs, and play especially chosen to promote emergent literacy skills and motor development for toddlers and children (ages 15 months - 3 years) with their caregivers @ Falmouth Public Library. ​Wiggle to the Music Put on your dancing shoes and move to the music in this class promoting motor development for children ages 2 and up and their caregivers @ Falmouth Public Library. Not sure which group is right for you? Click here for our Guide to Play & Learn Groups By Age. For Play & Learn Groups in Sandwich, visit The Sandwich Partnership for Families. ﻿﻿For Play & Learn Groups in Bourne, visit The Jonathan Bourne Public Library - Kids.